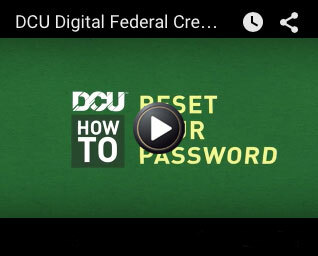 In the event that you forget your Online Banking password, DCU's Self Service Forgotten Password tool will allow you to easily change your password at any time. The forgotten password tool will deliver a temporary password to the phone number you have registered with Online Banking. If you have texting enabled, your password will be delivered to your smart phone or mobile phone by text message. The password tool is reliant on having accurate phone numbers attached to your account in order to work properly therefore if you do not have accessible phone numbers registered in Online Banking (found under My Settings), you will not be able to use DCU’s Forgotten Password tool. Click the Forgot Password? link found within the Online Banking login box which is located on the homepage. Input the phone number that you want the temporary password delivered to. The phone number you input MUST match one of the phone numbers you have registered with Online Banking (found under My Settings > Login & Security). Click Send me a New Password. A pop-up message will tell you that a new password has been sent to you. Enter the new password you received in the field and click Confirm. You will be prompted to change your password when you log in. If you do not have any registered phone numbers or your phone number is not working, please call us at 508.263.6700 or 800.328.8797 for assistance. How to Reset a Forgotten Password (video)  Forgot your password? These step by step instructions show you how to Use the Forgot Your Password tool. We highly recommend that you register at least one phone number with Online Banking. Also, it's a good idea to register the phone number that's most accessible to you. This is very important in order to receive a one-time passcode or temporary password by phone call or text. Click the My Settings link in the top, right-side navigation of the page. Under the Login & Security section, find Security Options and update your phone numbers if you need to. This section is also where you can add an email, an additional phone number, or add a phone number if you don't have one registered yet. In order to receive your one-time passcode as a text message, your smartphone or mobile phone must be enabled within Online Banking to receive text messages. Under the Login & Security section, find Security Options. Click Enable for Text next to your cell phone number. A pop-up message will tell you that a passcode has just been sent to your phone. Enter the passcode that you receive into the code field and click Confirm. Be sure that your joint owner has access to at least one of the two phone numbers registered with Online Banking, should they need to request a one-time passcode. Consider using an email address that both you and your joint owner have access to for retrieval of the one-time passcode as only one email can be stored in the system. If you, or a joint owner change your password, make sure you remember to share the new password with them so that they can avoid being locked out due to too many failed password attempts. If you are using your home computer, or logging in on a device that you use often, you may want to register that device as private so you will not need to go through the one-time passcode authentication process each time. If you use a software or browser plug-in that stores your password information (such as Last Pass), be sure to update your new login information within the software or plug-in. When you log into Online Banking you will be using a one-time passcode process for logging in. This is along with your member number and PIN (Personal Identification Number). This process provides a high degree of protection against stolen log-in credentials and keystroke logging malware. How is a passcode more secure? One time passcodes are more secure because they are only valid for a limited time and are only retrievable on your personal email or phone number. Unlike security questions where you use the same answers every time you log in, the passcode will change every time. In addition, the passcode is sent to your personal email or phone so you control where the passcode is sent giving a much higher degree of protection against fraud. How do I request a one-time passcode and how do I receive it? When you log into Online Banking from a computer that DCU does not recognize, we will send you a one-time passcode to verify your identity. You can determine how you want the passcode delivered to you choosing from email, phone call, or text message. Yes. When we say passcode - we’re referring to the code we send to you to authenticate (or register) your computer. This code is only valid for 10 minutes and is only used to validate the computer or device you are using to log into Online Banking. The passcode will be different every time it is sent to you. The password is the set of numbers, letters and/or characters that you choose to log into Online Banking. Your password is the same each time you log in until you change it. How will the log-in process affect how I log into DCU’s mobile app? You will not need to authorize your mobile device if you log into Online Banking through the DCU app. However, if you log into Online Banking using your mobile device's browser (not the app) you will have to authorize that device. Also, keep in mind that your Online Banking and Mobile App passwords are synced meaning that whenever you change your password, the password will change for each device you use to log in. Will I need to re-register every computer I use to access DCU Online Banking? Yes. The one-time passcode process replaces the current “three question” authorization process. All online banking users will have to re-authenticate their private computers. However, once you have authenticated your computer or device, you can choose to register that device as private which will bypass the authentication process going forward. How long will it take to receive the passcode? The passcode will be sent to you immediately. You should receive it within a few seconds. Why isn't my passcode working? If you are having trouble getting your passcode to work, it's possible that you are either entering the code incorrectly or that the passcode is no longer valid. This can happen if you wait too long to use it. For security reasons, the passcodes are only valid for 10 minutes once you receive them. If too much time has elapsed, try getting a new passcode and then logging in. If you are still experiencing issues logging in, please call us at 508.263.6700 or 800.328.8797. Can I choose my own passcode? No. The passcode is randomly generated when sent to you. This makes it much more difficult to commit fraud and what makes this new log-in process so much more secure for our members. Will I use the same passcode to authorize all my devices? No. The passcode is randomly generated when sent to you so it will be different for every device or computer you authorize. Will I be able to skip the passcode process when logging in and set it up later? No. You will need to authorize the computer or device in order to log into Online Banking. However, once you have authenticated your computer or device, you can choose to register that device as private which will bypass the authentication process going forward. Can I receive my one-time passcode to an international phone number? Yes. For the most efficient delivery of your passcode, we recommend using the email or text delivery option however members may still receive their one-time passcodes by phone call to a domestic or international phone number you have registered in Online Banking. Will I need to change my Online Banking password? Yes. Having the same password for a long time is a continued risk to your security so we're using this opportunity to have all members update their passwords in order to keep them updated and current. You'll also now be able to use special characters which will increase the security strength of your password. Also, note that your password is synced with your Mobile Banking password so once you change it, it will be changed in both places. Your password must be between 8 and 18 characters, contain at least one number and one letter and is case-sensitive. You are also able to use special characters in your password if you choose, although this is not a requirement. Keep in mind that your password is synced with your Mobile Banking password so whenever you change it, it will be changed in both places. How will my Personal Financial Management Software, such as Quicken or mint.com be affected? Depending on the type of connection your software has with DCU, you may need to input your new password for a new connection. Your software may also require the one-time passcode authentication process to continue your connection. Visit our Online Banking page for a complete, up to date listing of supported browsers along with links to their download pages. Why isn't my browser supported anymore? As browser versions get older, they become less and less supported over time. We’re making enhancements to security and adding additional functionality to our Online Banking. As such, some of these upgrades are no longer supported by certain browser versions. Updating your browser to the latest version enables you to receive all the benefits of emerging technologies while ensuring up to date secure internet browsing. Visit our Online Banking page for a complete, up to date listing of supported browsers along with links to download the latest versions of these browsers. Do Mac users have a different experience than PC users? No, DCU’s Online Banking is compatible with both Mac and PC. Is my dial-up connection supported? Unfortunately, no. Due to increased technology requirements for the upgrades, dial-up users may experience decreased performance and time-outs.